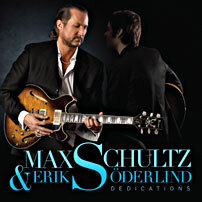 This CD “Dedications” featuring guitarists Max Schultz and Erik Söderlind is intended as a tribute to many of the world’s finest guitar players and is a perfect example of guitar duo playing where everything falls into place. On some tracks the duo are joined by Fredrik Jonsson, bass, and René Martinez, percussion. For some time now I have been playing duo with the very talented young guitarist Erik Söderlind. When Laila Gavatin approached me with the suggestion that we make a CD in dedication to our guitar heroes, it turned out that Erik and I have many favourite names in common: Wes Montgomery, Pat Martino, George Benson, Pat Metheny, John Scofield and Joe Pass to name only a few. There are also some guitarists who have meant a great deal to me. John McLaughlin, who, with his expressive, powerful and extremely personal style, not only influenced me but also opened up many doors musically for me. He succeeded in making me discover, in addition to other jazz guitarists, Indian music and flamenco. My piece dedicated to him is inspired by his collaboration with flamenco guitarist Paco de Lucia. Jimi Hendrix was the one who inspired me to begin playing the guitar in the first place. He was a brilliant improviser who influenced many people in jazz, including Miles Davis, and we play here a version of his “Drifting”. Frank Zappa, a composer who, in his own words, “happened to play the guitar”, was a considerable influence on me with his original style. Here we play one of his more jazz-oriented tunes, “Blessed Relief”. John Scofield, with his concentrated blues style that I like very much, receives a little gospel-type tune of mine dedicated to him. Naturally there are other guitar players that have influenced us but this is the selection that Erik and I agreed upon. They constitute a group of fantastic musicians who have meant an enormous amount not only to us but surely to everyone who is interested in this form of music, Jazz. As regards guitar duos, in classical guitar literature there are plenty of examples to choose between, however that is mostly notated music. When looking at musicians associated with improvised music in the fields of jazz and contemporary music the numbers of guitar duos are fewer. However, guitar players usually love getting together and seeing what comes out of it but there is often a difficulty in co-ordinating the roles of each player so that one doesn’t “cancel out” the other. There are many things to consider in the way of bass lines, chords, melody statements and who will lead and who will support etc. Therefore when a successful guitar duo comes upon the scene it is something to be celebrated. These two musicians have worked hard at the job of building a composite sound, matching their instruments to one another carefully and, perhaps, most important of all, deciding upon a duo repertoire that will hold the interest of the listener. This CD “Dedications” featuring guitarists Max Schultz and Erik Söderlind is a perfect example of guitar duo playing where everything falls into place. On 6 of the 14 tracks you will also hear the sensitive bass playing of Fredrik Jonsson and on 4 tracks some astutely played percussion by René Martinez. Intended as a tribute to many of the world’s finest guitar players, some regrettably no longer with us, this is a musical journey through a guitar player’s hall of fame, together with some originals written by Max and Erik in homage to some of their favourites. The opener of this album, Mont-Saxonnex, refers to a little village in France where Erik Söderlind composed it one Christmas. In terms of commercial success, the composer of Mimosa, George Benson, born 1943, almost stands alone as a guitarist. From his first albums in 1964 with organist Brother Jack McDuff (his second being titled “New Boss Guitar”) Benson went from strength to strength adding vocals to his talents, and has to this present day made over 65 albums in the fields of jazz, funk and R & B. The lyrics of Dedicated To You were written by the late Sammy Cahn, whose son happens to be Steve Kahn, a very successful contemporary jazz guitarist. It is a particularly beautiful ballad and receives a memorable treatment by the duo. Road Song was written by Wes Montgomery and recorded by him only one month before his untimely death at the age of 45. The year was 1968. Bass and percussion on this track add to the warm, irresistible groove. In 1975 John McLaughlin’s India-inspired Lotus Feet was composed and recorded by the Mahavishnu Orchestra and it has a wonderful meditative quality that has made it one of McLaughlin’s most enduring compositions. One of the most successful jazz guitarists and group leaders of the 70s and 80s is Pat Metheny, capable of playing a wide range of jazz-oriented music. For Django is the title of an album and composition by guitar giant Joe Pass from 1964 where he paid tribute to one of his heroes, Django Rheinhart. Pat Martino, born 1944 grew up playing modern jazz guitar, often in the company of organ players, making many albums. In 1977 he suffered an illness affecting his memory and was off the scene for ten years, making a jubilant reappearance on the Muse album “The Return” in 1987. In 1972 Frank Zappa recorded the album “The Grand Wazoo” on which his jazz waltz Blessed Relief<(b> was featured, surprising many of his fans who had not heard this kind of music coming from him. Drifting appeared on a now quite rare album called “The Cry Of Love” featuring posthumous studio recordings by Jimi Hendrix. It is regarded as a treasure and we are therefore very fortunate to be able to hear it played by Max and Erik. Guitarist John Abercrombie was born in 1944 and his composition Even Steven comes from the 1993 album “Solar” in which he collaborated with another famous guitarist, John Scofield. Abercrombie even played electric mandolin on that album. Between 1974 and 2007 he has recorded more than 20 albums under his own name and over 40 with others. His work with the jazz/rock band “Dreams”, Billy Cobham and the Brecker Brothers brought his name to the public ear and eye. The fore-mentioned guitarist John Scofield, to whom Max’s Song for Sco is dedicated, was born a little later in 1951. He was a member of the Miles Davis group for the first half of the 80s and since his first album “East Meets West” in 1977 he has made more than 35 albums in his own name, in which he has shown his mastery of many styles encompassing bebop, fusion, soul and funk. Mr Stoneface is a short tribute to one of Sweden’s most internationally known and popular jazz guitarists, Rune Gustafsson, the title referring to Rune’s everpresent expression of complete concentration as he plays his perfectly invented lines. Produced by: Jonas Knutsson and Laila & Charles Gavatin's Foundation. Max Schultz guitarr is heard on the left and Erik Söderlind's on the right.